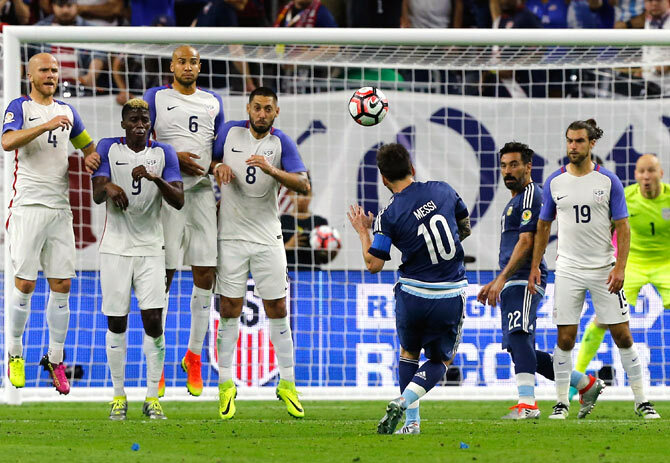 Lionel Messi scored his 55th international goal to become his country's all-time leading scorer as Argentina thrashed hosts the United States 4-0 to ease into the final of the Centenary Copa America on Tuesday. Many of those in the 70,858 crowd in Houston had come to witness the Barcelona star etch his name in the history books and he did not disappoint, curling a sensational free kick past Brad Guzan after 32 minutes to put Argentina 2-0 ahead. Messi had been chopped down by Chris Wondolowski 25 yards from goal as he burst forward and the ensuing strike moved him clear of previous record holder Gabriel Batistuta's 54 goal tally. "I am happy to have surpassed Batistuta's record and I want to thank my team mates, it's theirs as well," Messi, who turns 29 on Friday, told reporters. 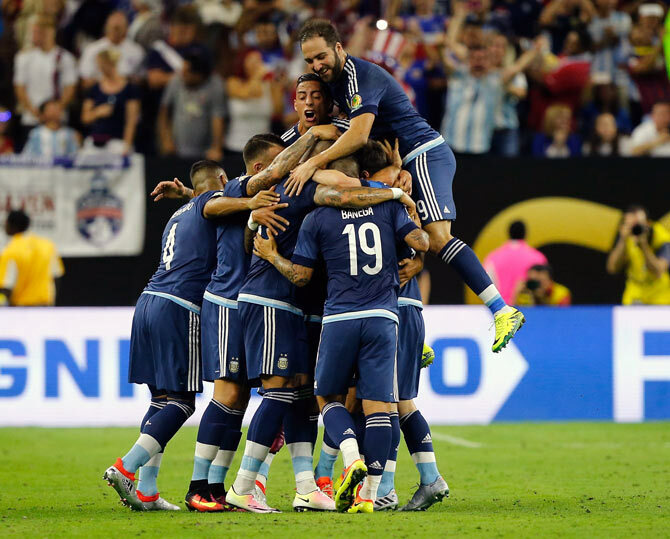 The win, meanwhile, advanced Argentina into Sunday's final against either Colombia or reigning champions Chile, who meet in Chicago on Wednesday. "We needed to get back in a final but we can never get ahead of ourselves," Argentine coach Gerardo Martino assed. "We've always taken it one game at a time." "We are pleased with our general production (so far)." Martino started Ezequiel Lavezzi up front in place of the injured Angel Di Maria and it took the China-based winger just three minutes to make his mark when he got on the end of a Messi chip to head over a stranded Guzan. Argentina dominated the first half and Messi's goal was just reward for their superiority but if the home side thought they could stage a second-half fightback, they were sadly mistaken. US coach Jurgen Klinsmann made two changes at the break but Napoli striker Gonzalo Higuain scored a third goal four minutes into the second period when he beat Guzan at the second time of asking after the keeper had saved his initial shot. The US enjoyed more possession as the match progressed but never managed a shot on goal for the entire game as Argentina exposed the gulf in class between the very best South American and North American sides. Messi, who captained the side in his 112th international, almost grabbed a second eight minutes from time but Guzan turned his shot around the post for a corner. However, the mercurial forward was on hand to have a say in the fourth goal, when his pinpoint pass set up Higuain to complete the rout with a simple tap in after 85 minutes. The result means Argentina have scored 18 goals in five games and conceded just two as they power towards what they hope will be their 15th Copa America title, and first since 1993, to take them level with all-time leader Uruguay. 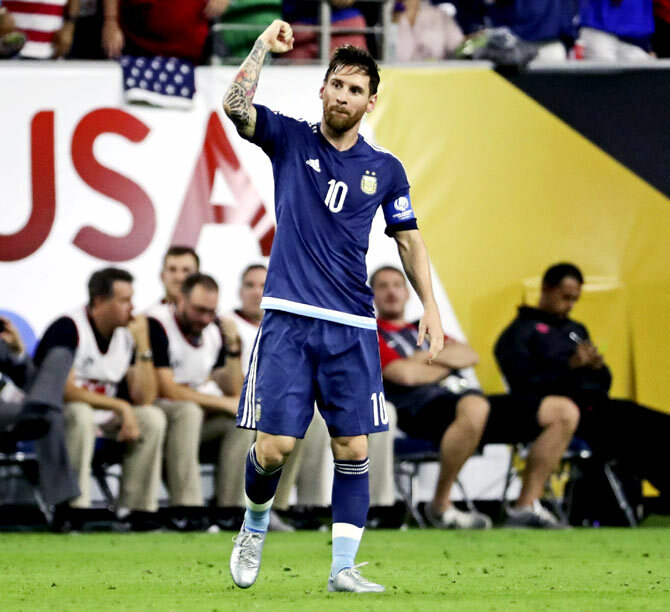 The win would also cap Messi's international career after years of disappointment. Argentina reached the finals of their last two tournaments, the Copa America in 2015, and the World Cup in 2014, but were narrowly beaten in both. "When you concede a goal after three minutes against such a team... that's when you've already lost your mental battle," Klinsmann lamented. "Once they have a lead they're not giving that lead away. "It's a special team Argentina," he added. "You saw tonight why they are the number one team in the world. I told the guys there's nothing to be ashamed of."